Jantzi Construction Company of Croghan began demolition of the Quonset hut that houses the theater portion of Tamarack Movie House on Inlet’s Main Street on Monday, October 15. The decision to take down the building, formerly known as the Gaiety Theatre, was necessitated by a number of financial factors, according to Brandon DiMartino, who owns the building and the adjacent Tamarack Café with his wife Megan. 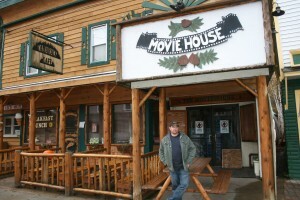 High on that list of factors is the film industry’s current transition to digital film formats which would require the couple to swap out their current film and projection equipment at a cost of $50,000 to $70,000—a daunting investment for the movie house which is only open in July and August. This entry was posted in admin and tagged carol hansen on October 18, 2012 by Carol Hansen. Charles Gaetano (front row, right) and his children-Bill, Brian, Gregory, Chuck, Mary Judith, and Colleen- cut the ribbon to the grand staircase and balcony that is dedicated in memory of Connie Gaetano, who passed away earlier. Courtesy photo. 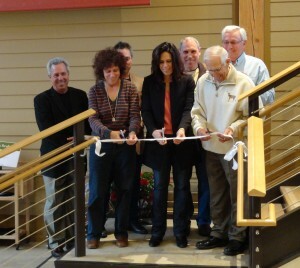 The Charles A. Gaetano family gathered at View, the arts center in Old Forge, on Saturday, October 13 to dedicate the grand staircase and balcony in memory of their family matriarch Connie Gaetano, who passed away earlier this year. View Executive Director, Jennifer Potter Hayes, welcomed the Gaetano family and friends to View and gave opening remarks. She thanked the Charles A. Gaetano Construction Company for their patience and commitment to View and the Town of Webb. She also remarked on the craftsmanship that went into constructing and finishing the building, including the beautiful staircase that graces the lobby and is the centerpiece of the building. This entry was posted in admin on October 18, 2012 by admin. 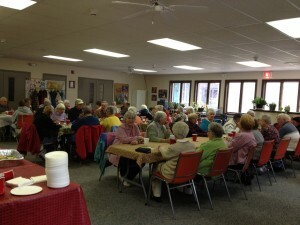 The Young at Heart senior group enjoyed a luncheon in the Senior Room of the Inlet Town Hall on Tuesday, October 9, compliments of Ozzie’s in Old Forge. Arrangements for the luncheon were arranged between Young at Heart board member Letty Haynes and Kirsty Sutherland, Ozzie’s owner, earlier in the summer. “Because Edie and Ted Schreppel, members of our group, are such good customers of Ozzie’s, Kirsty called me and said she would like to do something special for the seniors,” Letty said. The two ladies settled on a menu and a per person price, then set the date for after Columbus Day when it wasn’t as busy at the restaurant. This entry was posted in admin and tagged Marianne Christy on October 18, 2012 by Marianne Christy. The Kiwanis Club of the Central Adirondacks has announced that the Student of the Month for October is Colin Criss. 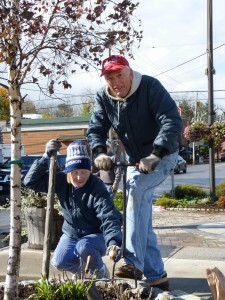 Colin is a senior at the Town of Webb School and the son of Doug and Barb Criss of Old Forge. Many people have had a friend or relative who has been diagnosed with lung cancer. And yet, unlike other cancers, such as breast cancer, little is heard about this disease. The intent of the vigil is to lend support to survivors, to those currently battling lung cancer, as well as to those who have lost someone to the disease. And, as importantly, the vigil brings attention to lung cancer in the hope of urging government officials to press for more funding for lung cancer research and treatment. This entry was posted in admin and tagged Columnists, margie O'Hara on October 18, 2012 by admin. I am running for Herkimer Co. District Attorney in the November election. As a candidate, I have a specific platform for improvement in the District Attorney’s Office. Unlike Herkimer County, many counties regularly confiscate money, equipment and vehicles used in drug crimes and other felonies. These “forfeitures” can be used by law enforcement to purchase equipment at no cost to the taxpayers. Oneida County collects between $100,000 and $200,000 a year and over the past ten years has garnered over a million dollars in extra cash. This entry was posted in admin and tagged Iocovozzi, Letters to the Editor on October 18, 2012 by admin. Heather and Ed Stafford were among the Old Forge Garden Club members who recently helped put the Point Park gardens to bed for the winter. They also pulled up some invasive deer-resistant plants. For more information, see Gary Lee’s column.